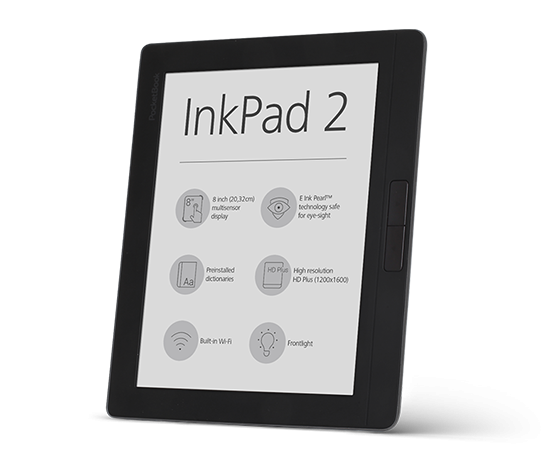 PocketBook InkPad 2 – the premium E Ink e-reader with 8-inch screen and frontlight. From its predecessor, PocketBook InkPad 2 inherited the key features and characteristics that are appreciated by users in 35 countries, and at the same time, the new e-reader received some notable enhancements. Among the key of them – the improved optical properties of the screen, updated design, ergonomic mechanical paging buttons and lightweight housing. Like the first PocketBook InkPad, the e-reader is equipped with 8-inch diagonal multi-touch E Ink Perl screen with the highest resolution on the market of E Ink devices – HD Plus (1600x1200 pixels). Due to the new screen construction PocketBook InkPad 2 provides even higher contrast, compared to the predecessor. The "book size" screen of the e-reader is especially convenient to read illustrated business books and educational literature, periodicals and documents. 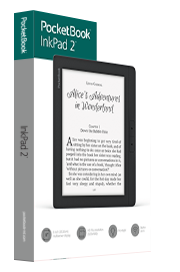 PocketBook InkPad 2 is irreplaceable at home and in office, for the active self-development and the most comfortable reading. A powerful processor of 1GHz and 512MB RAM provide quick response and stable work of any application. 8GB of internal memory (up to 32 GB) will allow to collect a real pocket library of more than 2000 books. A capacious battery of 2500 mAh provides up to a month of reading without recharging. And finally, PocketBook InkPad 2 supports 18 text and 4 image formats without converting. The e-reader gives many additional opportunities. Text-to-speech feature, as well as the support of MP3 format allow to listen to the favorite books and music. The pre-installed ABBYY Lingvo dictionaries will be invaluable when reading foreign literature. Built-in wireless Wi-Fi together with Dropbox, Send-to-PocketBook and PocketBook Sync services will allow to deliver any e-content on the device fast and easy, without having connection to PC. Another inherent feature of InkPad dynasty is the LED frontlight. Powerful LEDs evenly spread the light over the screen surface, that ensures the highest comfort for the eyes when reading in any lighting conditions. Users will appreciate the new design and perfect ergonomics of the device. With the weight of only 305 grams, PocketBook InkPad 2 is lighter than most of the analogues. Convenient mechanical paging buttons are placed on the front side panel. Due to the function of screen orientation changing, the e-reader can be turned so that the panel with buttons is on the left or right side, depending on which hand is more convenient to hold the device with. Soft-touch back panel prevents fingers slipping and gives a pleasant tactile sensations.